My grandfather Joe Bayless was born in Circle, Alaska in 1910 on the banks of the Yukon River when it was a "super Highway" running through Alaska from The Pacific Ocean all the way to Dawson city. Paddle boats chugged up and down it in the summers and Dog sleds ran it in the winter. Back then if you lived in the interior of Alaska and you had something it came up the Yukon River and most likely was brought there by my Great-Great-Grandfather William Bayless and his son Otto. Joe was a true Alaskan character born into a family of Alaskan characters. Half the people who knew Joe said he was worthless and the other half agreed. Joe was the kind of man Robert Service wrote about in the poem "Men That Don't Fit In." Joe didn't want anything to do with the family business or maybe the business didn't want anything to do with Joe ether way Joe at 15 busted out on his own. He got a 9 day mail route from Nenana. Which means he would leave and be back 9 days later just to drop off, load up and do it all over again. It was during this time he met and became friends with the famous Leonhard Seppala. 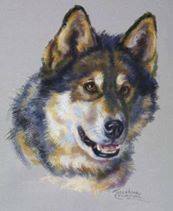 Seppala helped Joe put together a top notch dog team with a smart and well trained husky named Jack as lead. Joe's team was the second to the last team used in the Nome Serum Run in 1925. Charlie Olson would be picked to drive Joe's team because the organizers just didn't want to put that much faith in a 15 year old boy from the Yukon. Jack went on to be the first dog to enter Nome that famous day but did not get the glory because he was a "free lead" running in front of Balto the whole way and... Balto sounds so much better in the press. Jack did get his pretty mug on a bunch of menus at the Alaska Steam Ship Co. when Josephine Crumbine painted his picture. Joe liked to tell a story about how when he was hauling mail he came to a cabin that he had stopped at many times outside of Huslia. When he pulled up there were tents put up outside the cabin. All the children were living in the tents because the sole person left to care for them had died and was still inside the cabin and in bed. The children had moved outside into the tents and were waiting for their parents to return. The children had just gone on about their lives while they waited. He stayed with them and sent word in to town by the next musher that someone needed to come out to the cabin and deal with the children and the deceased person. My grand father was so impress with the resilience of these children he made sure that his children could all hunt and fish and survive in the wilds of Alaska. We have nothing but his word but he always calmed it was the Attla family. We don't know how much truth there is to the story but Joe did know George pretty well. But Joe's Shenanigans started way back when he was in the first grade. Most people had a dog or a cat for a pet, but in keeping with being a true Alaskan character born into a family of Alaskan characters, my grand father had a pet bear. He was called Joey-bear. Well Joey-Bear was a little year old blackie that love my grand father very much. To the point of following him to school the first day of school. The teacher was a missionary type from back east somewhere come to convert the heathen and educate the children of Alaska. He was about to have a close encounter of the worst kind with Joey-Bear. It is kind of sketchy how the teacher wound up in the school outhouse with the bear sitting outside the door and all the children laughing hysterically, but one thing was clear that night at the emergency meeting of the town counsel. Joey-Bear and the Teachers resignation were the only two item on the agenda. Joey-Bear lost and we will see him in the next life because he was a really good bear. Soon came the era of the bush pilot and people like my Grandfather were put out of business and the era of the sled dog passed into history. Being made unemployed by fighter jocks returning from war in Europe and in search of adventure in Alaska, my grandfather returned to the old Alaska standard... mining. Joe worked his own mine in Wiseman and was semi-successful at it. His real skill was at running mining operations. So he became a mining foreman. Running camps and making them produce. He even spent time in Brazil working at a diamond mine. Big rumor in the family is that we have a whole branch of the family living down in Brazil. One of the things Joe like to do was box. He was the Alaska State Amateur Boxing Heavyweight Champions, and at 6' 4" he had a long reach. There is a story about him being in a bar in Fairbanks and a young black man was being bullied by a bunch of guys. The guys didn't know two things. First that the young man worked as a mechanic for my great grandfathers trucking company and number two he was friends with the Alaska State Amateur Boxing Heavyweight Champion and worked for his daddy. From what I have been told the fight has become a Fairbanks legend. This young man was later killed in an accident and is buried in our family plot in Fairbanks. When I was about 4 years old my grand father came to babysit us while my mom gave birth to my younger brother. We were living in Burbank California at the time and my step-father was an Air force guy who was working at the "Skunk Works." My grandfather taught me to swim. When my mom came home from the hospital I calmly walked to the end of the diving board and jumped in and my mom just about jumped out of her stitches. At the time I thought it was pretty funny and looking back now I still do. Joe lived hard and died young. He was only 68 years old when he passed out of this world in Fairbanks. But him and Joey-Bear probably had a lot to catch up on. You do have a branch of the Brazilian family living in Washington State! My husband is Louie Bayless and Joe was his father. We have no photographs of Joe and would love to see one - would you be willing to post some? It was lovely reading your story, thank you. Grandfathers are so special. This story is very unique.